With all the mainstream media mental junk food now feeding humanity almost daily guaranteed lies in order to secure the stated agendas of the new world order, I want to pose a divider question. That's a name I made up for a question that is sure to divide people. Nevertheless a question that deserves attention and consideration from all critical thinkers and truth seekers. Today I pose this simple question only because it cuts through much of today's subjectivism, it tramples on people's belief systems, religions, opinions, political persuasion and some day it may even determine whether you live or die. It's a question we should all be able to answer with understanding and conviction because when we do we'll realize that doing can unlock many answers for humanity. The question is- What exactly is the truth movement? Yes, on the surface it may seem like a silly or trivial question. But is it really? Sadly and unfortunately many people especially in America are actually trained and thoroughly brainwashed into thinking that the truth movement is nothing but "conspiracy theorists" and all rest that comes with that engineered mass mind conditioning. If you believe this way I encourage you to forget what you've been told and think on your own for once. For those awakened and seeking truth let us spend some time answering this question or attempting to put this concept in perspective. First off, truth is realized. No one has a patent on truth, not myself, not anyone in the truth movement. Anyone can be wrong about something but the pursuit of truth as a lifestyle that involves first being completely disconnected from the matrix of lies then using all your senses, accepting when you might be wrong, researching things, seeing the bigger picture in light of history, established documents, current day observations, and in light of the technology assisted information sharing. As I've indicated, all of this requires shutting off all mainstream media news. People that resist truth are almost always guaranteed to be looped into mainstream media junk, government scientific claims and highly coordinated and structured ongoing propaganda. Sadly these people are never aware of the mental information circus they are subjected to every day. We have powerful tools today for anyone with a clear and functional mind (free of mainstream media news and government propaganda of course) to enjoy the pursuit of objective truth, as it is realized not something someone convinces you of. Anyone who cannot wrap their head around this concept is permanently bound to slavery, subjectivism, mental anguish, stress, and oppression at the hands of government and their control system. You could never truly be free AND still believe and go along with government lies no matter what. Similarly, you cannot live in a subjective world without any sense of truth and objectivity AND at the same time think that you are somehow in control. Many people try to live in a purely subjective world never acknowledging that there really is an expression of truth versus lies that objectively exists. All that said, since government loves to throw out "manifestos" into the public minds every time they spin off a gun-grab false flag shooting, I thought it proper to put out a manifesto explaining exactly what I believe the truth movement really is. It is my hope to cut through the stubborn minds that resist truth and lay out some concrete ideas for understanding what the truth movement is all about. What is the Truth Movement? The truth movement is an idea and a citizen based grassroots peace and social justice movement that began mostly in the aftermath of the September 11, 2001 globalist terror attacks on America. An attack planned and coordinated by a network of global financial elite referred to by many as the nameless "new world order". For this reason the truth movement began as a focused attempt to reveal the truth about 9/11 but has since expanded to cover many other social justice issues that plague humanity. We believe this era of information awareness and sophisticated technology has both allowed corrupt governments to become more oppressive and at the same time has allowed the truth about the new world order to become common knowledge to millions around the world. The truth movement represents the spirit and commitment of humanity to focus on exposing the globalists, corrupt politicians, and elite who are working tirelessly to enslave humanity and usher in their new world order. The truth movement, while it's mostly an idea, it is also a conscious commitment to actions that promote social justice, freedom, liberty, equality and opposition to political corruption, oppression, tyranny and fascism. We hold politicians and media responsible for the lies they tell that keep humanity in a perpetual state of enslavement and war under the guise of "safety" from terrorism shown to be created and orchestrated by the same controllers who seek to diminish your freedoms and liberty. Above all, the truth movement seeks to expose all lies, political propaganda, mass deception and staged news at any cost. It has no obligated allegiance to any political party (including the libertarian political party), religion, race, gender, culture or other interest because all of these interests are vulnerable to government propaganda. 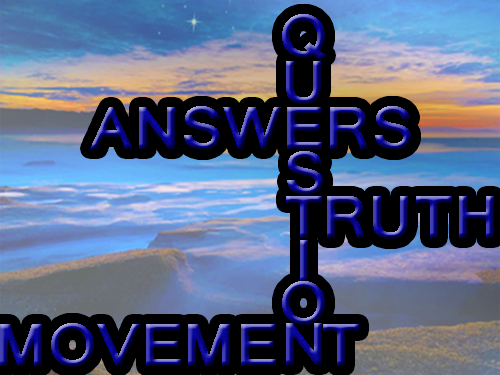 The truth movement acknowledges that truth itself is the thing that holds the most value regardless of who it may offend and it is incumbent upon all of us to do the best we can to line ourselves up with the truth whatever that truth may be. We acknowledge that in the past some organizations and leaders have been described and referred to by mass media as representatives of the truth movement, but we believe that is not possible because the truth movement is a conscious network without a single leader. It is a global consciousness matrix that has evolved out of humanity in the post 9/11 era that cannot be stopped. We believe government controllers would love to suggest that the truth movement is represented by one person or one organization because that makes the idea easier to discredit or destroy by simply destroying or discrediting that single person or organization. Unfortunately for the controllers the truth movement is a living and breathing concept that lives inside of you and I, and it is the essence of humanity's conscious attempt to survive this modern day tyranny and mass mind control. We believe that acknowledging the essence and reality of the truth movement is a great starting point to becoming mentally free from the enslavement humanity is under. Like the essence of realizing that you are born a free sovereign human being, likewise truth is a realization not a dogma or belief to be force on anyone. The goal is to de-politicize the movement and the concept and to understand it in your heart and mind as an organic phenomenon of humanity. This organic mental awakening will unlock your mental chains and allow you to more quickly understand and recognize government lies and deceptive propaganda and begin to reveal many answers about life you have now. This human awakening is a major threat to the control system which has nothing but empty entertainment, fear and anxiety-producing news, government intimidation by enforcement of laws, and other lies and propaganda to offer humanity. In the same way that government cannot sell you spirituality, organic love, true joy and a sense of human purpose, likewise it cannot sell you vivid truth and the passion and energy that comes with acknowledging truth. Everything government offers is shallow, empty, temporary and based on artificially engineered feelings. Imagine how weak and powerless all of this compares with discovering who you are, who other truth seekers are, and the power of global human unity and purpose? This is the power of being human. And this is what the truth movement is truly all about. If you understand this message and agree, share this message with someone who still thinks the truth movement is about conspiracies and nothing else. Pass a candle of light to those sitting in the dark to help light their way.